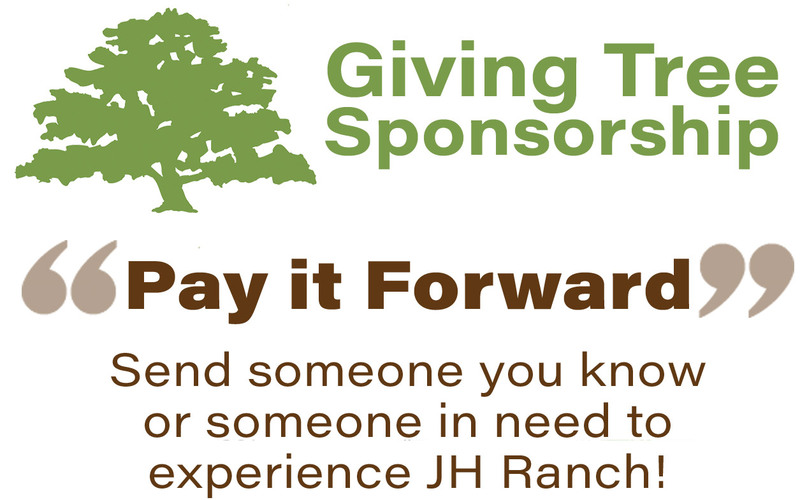 The Giving Tree program allows you to pay forward your adventure at the Ranch by sponsoring someone else! Every year, nearly one in four of our guests are sponsored through the Giving Tree program. If you desire to come to JH Ranch, but cannot afford the full tuition cost, we would love for you to apply for partial aid through our General Giving Tree program. Gifts are awarded according to the avaiablity of funds raised through General Giving Tree donations. All applicants are required to contribute towards their registration cost and must apply for aid before registering for a program. Registrations are considered "Pending” until gifts are awarded and a payment plan is established for your contribution. Unfortunately, spots in the programs cannot be held or reserved for Giving Tree applicants. Applying for aid does not guarantee that we will be able to raise an amount to help you with your registration cost; however, we will also support you by providing material to assist you in your own fund raising. To apply for the General Giving Tree program or to learn more please contact Shari Johnson, the Giving Tree Registrar at 800-242-1224 or shari@jhranch.com. Thank you for giving to JH Ranch Giving Tree! Giving Tree exists to assist families with spiritual, personal, relational, and/or financial need who desire to experience JH Ranch. You can give to help send our General Giving Tree applicants, or you can give and nominate someone you know to receive Giving Tree assistance. If you have someone in mind to receive Giving Tree assistance, please contact Shari Johnson, Giving Tree Coordinator, to notify JH Ranch of your nomination. The Giving Tree Committee will meet to review and approve your nomination. If you choose to nominate someone to receive Giving Tree assistance through your donation, you have the option to do so for up to two consecutive summers following the date of your gift. If a family you nominate is unable to attend for either of the following two summers your gift will be included to help families that have applied for aid. All Giving Tree donations are non-refundable.